Earlier this month, Ideavelopers closed a deal with Sherif Nassar, Founder and CEO of nefsak.com, where Ideavelopers will invest 10 million EGP in his company. Founded in 2008, Nefask has been the fastest growing Egyptian online retailer with sales increasing five times year over year. Today nefsak’s online catalogue has over 18,000 products covering a wide range of categories from computers and electronics to home decoration and fashion. The investment will help nefsak develop into a household brand and scale its operations to meet growth expectations. In his comment on the investment, Ideavelopers Managing Partner, Tarek Assaad said, “We are delighted to work with nefsak, we believe they are the leader in their market. The level of dedication and passion that Sherif Nassar demonstrated while building this company is impressive. These characteristics are essential in an entrepreneur whose aspiration is to build an amazon.com for the Middle East”. 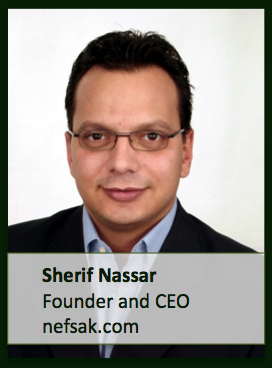 Sherif Nassar started attracting the attention of local and international investors in late 2010. “I chose Ideavelopers”, Sherif says, “because I knew they can help support the company as it grows. They can provide necessary funds, sound strategic advice, and access to local networks”. Both, Tarek Assaad and Ziad Mokhtar from Ideavelopers, as well as Mr. Sameh Farid have joined the board of directors of nefsak. Wow, congratulations from New Egypt Consulting for internet marketing and social media consulting. Good job, from Expede IT, for software development. We also are banking on eCommerce as well as Portals for Egypt, that will rival top US brands. We just released http://www.YallaBeepBeep.com, and are starting its marketting campaign. YallaBeepBeep.com, is aimed to be the top featured automotive / vehicle web site in Egypt followed by other countries in the Middle East and North Africa and more. It has everything automotives, such as selling or requesting and renting, cars, bikes, boating and equipment. it also has parts and accessories as well as services and fun automotive stuff. We are going to be looking for potential investors, once we pump up the volume of traffic to the desired level, for more info email me at info@expedeit.com.